4 Degrees: The Arc of Trivia is a trivia game that was included with the Game Wave system when it was launched. 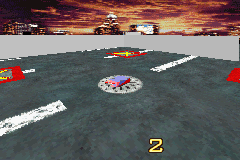 Up to six players compete against each other and the clock to get the highest amount of points. A game consists of twelve challenges, two from each of the six available categories: The Arts, History, Science, Sports, Lifestyle, and Geography. Even though every challenge needs to be played, players take turns choosing a category by rolling a die and they receive bonuses to their scores for their category. 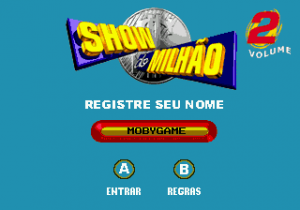 A challenge consists of a question with four possible answers; Players choose the right one by pressing the A, B, C or D button on their remotes. Entered answers cannot be changed. The title refers to the four clues that are provided as time counts down. Clues make it easier to choose the right answer, but less time on the clock leads to less points. Choosing an incorrect answer has the player lose that amount of points. This is where the die roll comes into play. If a player rolled a 100, the amount of points earned or lost is doubled. A 150 triples that, and 50 for instance halves it. Only the player who chose the category can get a high amount (even though 25 is also available for instance). Other players always have the standard value of 50. When the time is up, the answer is shown and a scoreboard appears.